Even a little 10 horse outboard can really fling around a lightweight aluminum boat like this one when no one is aboard. When I was about 13, my brothers and I went out in my dad's old aluminum boat, a 1958 12' Feather Craft with a 10 hp Johnson which I believe was a 1961. That old Johnson made me wonder how the company survived. You had to pressurize the gas tank, and the slightest bit of junk in the gas would clog the fuel system. It was prone to fouling the plugs as well. I can't count the times I removed the little fuel sediment bowl, blew out the fuel system, took out the spark plugs and cleaned them, and went on my way again. The engine had a tendency to get you there, but not get you home. It taught me the importance of backup propulsion and carrying a few tools. The engine was also hard to start when warm. If it was cold, you could choke it, and it would start. If it was hot, you did not choke it, and it would start, or not. If it didn't start, it was time to clean the works again. But if the engine was warm, it was very hard to get it to start. If you used the choke, it would flood it, but if you did not, it would sputter a bit and stall, or just not start at all. That engine did not have a starter lock-out mechanism to prevent starting in gear, or starting at high throttle settings. It did have a throttle lock, which prevented high throttle settings while in neutral. One way to get the thing to start when it was being difficult was to put it in forward, open the throttle, and pull. It was very likely to start if you did that, but it would also take off in whichever direction you had it pointed. My brothers and I went to the small islands off Coconut Grove called the Dinner Keys. There we found a derelict skiff, which we decided it would be fun to take home and restore. We found a long rope and attached it to the skiff and to our aluminum boat, then I pushed the aluminum boat out from the shore a ways and got in to tow the derelict boat off the beach. It was partially embedded in the sand, so my brothers stood ashore to help free it as I pulled it off. While we were messing around on the island, the engine had cooled off, and it did not want to start. Outboard engines were pretty hard to pull back then, and I weighed only about 120 lbs or so. After a couple of pulls, I had to stand up and throw my weight against the starter rope to turn the engine over. I pulled until I was nearly exhausted, but the engine was just not going to start. I decided to try the old start-in-gear trick. I shifted the engine into forward and opened the throttle, then gave a mighty tug on the starter rope. At that moment, the engine fired at full power, and I lost my balance from pulling so hard. I went over the transom in a flash, and the engine slammed hard over. 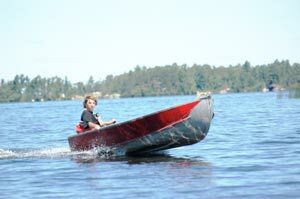 A 10 hp engine will really fling around an empty 100 lb aluminum boat when at full power and turned hard over. I was only in a few feet of water, and fortunately for me the bottom in that area is just grass and sand/mud, fine for my bare feet. I had time to stand up before the boat circled back and was headed right for me. Like an idiot, I decided to try to grab it and reach across to get the throttle. I did grab it, but the boat tore from my grasp and the throttle was way out of my reach on the other side of the boat. Not thinking about the fact that it had now encircled me with the tow rope, I decided to try to grab it again on the next pass. I nearly succeeded, and somehow avoided getting tripped by the tow rope, but once again I failed to get my hand all the way to the throttle and I had to let go of the boat. Meanwhile, back on the shore, my brothers had seen what was going on and had started pulling on the tow rope. I really don't understand how, but the engine never wrapped the tow rope around the prop, and I somehow avoided getting trapped by the tightening rope. The next thing I knew, the boat quit turning toward me, and was straining against the taut tow rope, leaping sideways and heading toward shore. I stepped over the rope and ran to follow the boat. It hit a kind of rocky part of the shore with a sickening screech of metal, and the engine promptly kicked up and stalled as it also hit gravel and sand. There were a couple of nicks in the prop and skeg and a few scratches on the aluminum hull, but nothing serious. So if you're ever wondering why they have all those lock-out mechanisms on modern outboard engines, it is because idiots like me will do things like that.